The MCA 384 has been designed to offer higher productivity to automated liquid handling workflows, increasing the efficiency and speed of pipetting processes, as well as delivering an outstanding level of flexibility. The head can rapidly change tip adapter plates during a run to offer a variety of pipetting formats. The pipetting head features a very broad volume range from 0.5 μl to 125 μl in the 384-well format, and from 0.5 μl to 500 μl in the 96-well format. It works with both disposable tips and washable stainless steel tips, which can be automatically interchanged during a run. Using fixed washable tips for the pipetting of reagents or solvents offers a reduction in running costs. The MCA 384 head can mount single rows of 24 or 12 tips, and columns of 32, 16 or 8 tips. This feature can be used to pipette controls or to conduct serial dilutions over different plate formats. An MCA 384 is pipetting quadrant wise from a 384-well plate to a 1,536-well plate on a TE-PS carrier. Exchange and pipetting of fixed tips and disposable tips during a run with an MCA 384. Double serial dilution with 32 channels in parallel. An MCA 384 is pipetting with different disposable tip formats into different plate formats. An MCA 384 is aspirating and dispensing into a 96-well format. An MCA 384 is aspirating and dispensing into a 384-well format. An MCA is performing multiple dispensing steps into 384-well plates. An MCA 384 is mounting disposable tips. An MCA 384 is changing adapter plates. Researchers at Germany's University of Konstanz have established a fluorescence-based method for screening small molecules to identify potential antimicrobial agents. Using the Freedom EVO® workstation’s MultiChannel Arm™ 384, the University’s Screening Center has developed an innovative technique allowing reliable liquid transfers down to 80 nanoliters. Scientists working in the Screening Unit at the Institute for Molecular Pharmacology in Germany are finding the low volume pipetting capability of the MultiChannel Arm™ 384 beneficial for the investigation of siRNAs and small molecule compound screening. 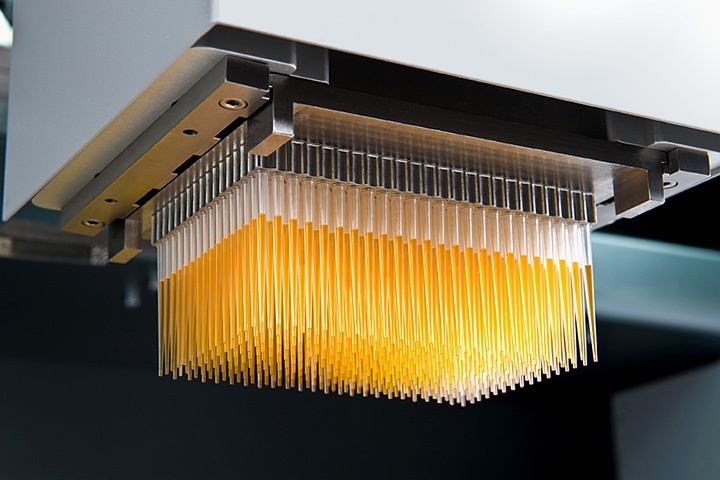 The Novartis Animal Health Research Center has invested in an automated compound logistics system to aid drug discovery, taking advantage of the exceptional pipetting capabilities of the MultiChannel Arm™ 384. High throughput screening for drug discovery depends on reliable liquid handling, like that provided by Tecan’s Freedom EVO® platform. Chicago-based company SAMDI Tech has automated its proprietary label-free SAMDI technology on a Freedom EVO system for performing rapid and quantitative analysis of challenging biochemical targets.